Learn how to build and edit the business structure by understanding what information is included for each level. Review the What is a business structure and Business structure levels guides before adding to or changing the business structure. To add a unit to a level in the business structure, merely select the parent unit, e.g. select the marketing entity to add an invoicing unit below it. A popup will appear where the details of the new level may be added. The information popup for the marketing entity, invoicing unit and property levels are the same. The accommodation type unit records different information and this popup will look different. Name This will be the name that will reflect on your invoices if the entity is set up as an invoicing unit. Abbreviation Mandatory field of up to 5 characters. Each abbreviation must be unique. Website Your official website url can be placed here to reflect on your documentation. Address fields Manually add the address details or click on the ‘Link Address’ button to link to an existing contact record and apply their address details. Information such as invoicing unit and logos stored on any level of the business structure applies automatically to any level beneath it in the structure. However, if a lower level has its own specific information recorded, that will override the automatic default. For example, if logos are stored only at the marketing entity level (African Savannah Collection) and for Beach Lodge, then the marketing logos will apply at all levels except for Beach Lodge, which will have its own. Marketing entity This represents the ResRequest system name and is the identity that is portrayed on the ResRequest login page. This information does not necessarily appear on documentation – except when reservations span multiple invoicing units. Invoicing unit This represents an invoicing unit. Invoicing unit classification and invoicing requirements (GL Currency and invoice prefix). This information will appear on Invoices and Proformas. Properties This represents a property / lodge. Currency (applicable to sale of extra services at the property). Some of this information appears on reservation documents. Accommodation types This represents the accommodation or room type. Rooms Rooms are setup within the Accommodation Type. This represents the number of rooms of the accommodation type. This information does not appear on documentation but determines the stock available on the ResRequest calendars. Room attributes Room attributes are optional room details, e.g. twin beds. Any number of attributes can be applied. Room attributes are defined on the Rate Component code table and can then be added to a room, e.g. double bed. 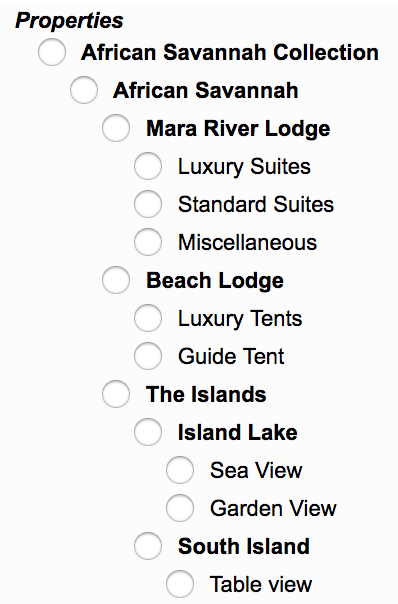 This information displays on documentation where the rooms have been applied to the booking. To edit a unit on the business structure, merely select it from the list and click on the Edit/View Selected button above. The information popup will open and information may be edited. Remember that editing this information is subject to user access so if the edit button is not active it most likely means you don’t have access to edit the business structure. Access is also limited to a Reservations server with master status. The structure on the availability calendar, as well as all of the other calendars, draws information from the business structure setup, i.e. The properties and rooms created on the business structure will display on the calendars, in the sequence in which they appear in the business structure.